Enermax this week introduced its new family of 80 Plus Platinum PSUs for ATX desktop computers. The new PSUs are said to be able to clean themselves from dust, and more notable are only 160 mm (6.3”) deep. The flagship Platimax D.F. PSU is currently the world’s smallest 80 Plus Platinum PSU rated for 1200 W output and capable of supporting AMD Threadripper, Intel HEDT, and 2P systems. High-wattage PSUs are usually rather large because high-capacity capacitors and other components required for such power supplies are bigger than components used for lower-wattage PSUs. Besides, components of such power supplies require adequate cooling when used under high loads, so makers of PSUs increase length of their products to 180 – 225 mm in order to accommodate quality parts and ensure their long lifespan. Enermax has managed to find PSU components (most notably capacitors rated for 105°C/221°F) that are small enough to fit into a 160-mm deep enclosure, work at 50°C ambient temperature under load for prolonged amounts of time without degradation and handle 750 W – 1200 W loads. The Enermax Platimax D.F. family of PSUs consists of 750 W, 850 W, 1050 W and 1200 W models that are compliant with the ATX12V V2.4 spec and carry the 80 Plus Platinum badges. The power supplies feature modular design and come with two EPS12V connectors (one 4+4 and one 8-pin), thus ensuring compatibility not only with ultra-high-end desktop motherboards (such as those based on AMD’s X399 'Threadripper' and Intel’s X299 'Skylake-X' platforms), but also with 2P server- and workstation-class mainboards. In addition, the PSUs feature four (750 W model) or six 6-2-pin (8-pin) PCIe auxiliary power connectors for graphics cards, a dozen of SATA power plugs, four Molex power outputs and one FDD connector. All the cables are individually sleeved (Enermax calls them Sleemax), which will please modders and those looking to build very “tidy” systems. 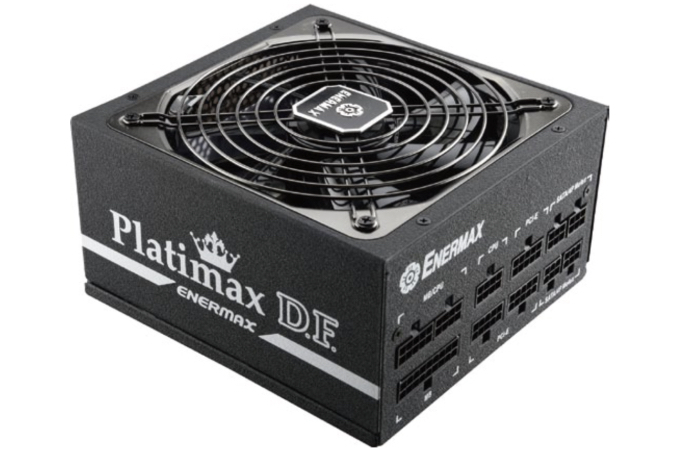 Besides relatively small dimensions and powerful specifications, the Enermax Platimax D.F. power supplies feature the company’s proprietary DFR technology that can rotate integrated fans in an opposite direction in a bid to blow the dust away. While the DFR technology can help to clean the dust from the PSU, it should be noted that when activated, it essentially exhausts dust from the power supply into the case, which is not exactly helpful for the PC itself (unless the PC is then cleaned). 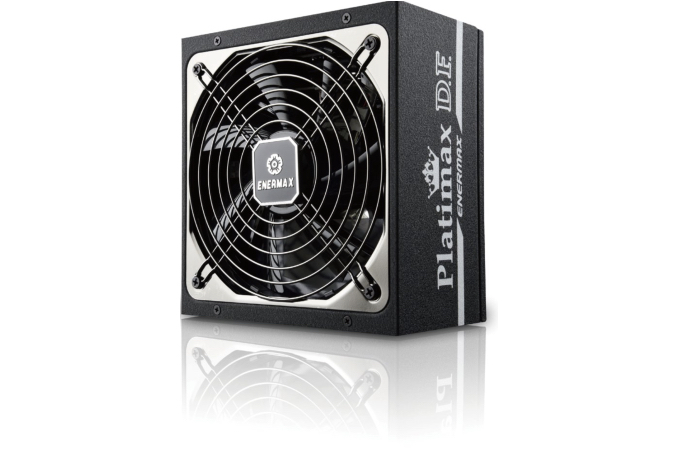 Just like other high-end power supplies, the Platimax D.F. can shut down its fans when the PSU load drops to 30% (for 1050 W and 1200 W) or 40% (for 750 W and 850 W). Speaking of fans, the PSUs are equipped with Enermax’s 13.9 cm fans featuring the company’s twister bearing technology and rated for 160 thousand hours MTBF. The Enermax Platimax D.F. will be covered with a five-year warranty, which is below warranties of other high-end power supplies, but it looks like the company wants to play it safe with its PSUs of reduced length. Enermax expects its new Platimax D.F. PSUs to hit the shelves in mid-September, but ETA may vary slightly between regions. As for pricing, the entry-level Platimax D.F. 750 W model is set to cost $184.99, whereas the flagship Platimax D.F. rated for 1200 W will be available for $249.99. "While the DFR technology can help to clean the dust from the PSU, it should be noted that when activated, it essentially exhausts dust from the power supply into the case, which is not exactly helpful for the PC itself (unless the PC is then cleaned)." I would like to thank you for the efforts you have made in writing this post. Thanks for posting Really Such Things Cisco 200-125 dumps. I would recommend your site to my friends. When the PSU is at the top, the rear exhaust fan . Exactly, Australia is quite popular in imparting knowledge to the students in every field and their education professionals are contributing a lot in a student's career through an assignment help service. one of the best assignment service provider is Go assignment Help. One can find a variety of assignment help by getting their assignments done through experts. Our writers are on the alumni list of top universities and have built an impressive resume. If you want us to ‘write essay for me’, then get in touch with us now!